In a large bowl, toss the broccoli with the oil, salt, and pepper, making sure that everything is coated and distributed evenly. Spread the broccoli out on a baking sheet and bake for 15 to 20 minutes, depending on your tenderness preference. I like mine a little crunchier, so 15 minutes is perfect for me. Seriously, I’ve now made this so many times now. AWESOME. Sweet! Yeah, it’s so easy, but so delicious. I give broccoli all the credit. 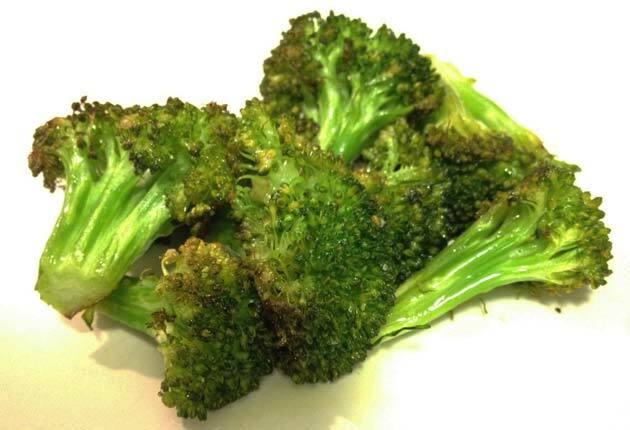 Michele, if you want to advance to the next level of delicious broccoliness, try tossing a few sliced garlic cloves in with the broccoli before roasting. When it comes out, zest a lemon and then squeeze half of it over the top. DYN-O-MITE! We do this with cauliflower + cumin + a touch of cayenne. p.s. How dare Heather leave you alone in the apartment during mealtime… shame on her! I almost never roast cauliflower but now you’re giving me the inspiration. Sounds delicious, Puj! Try it with lemon pepper…I put it in with the oil before roasting…. Vi, I do the same! I love lemon pepper on broccoli.